Active pharmaceutical ingredients (APIs) exhibiting low aqueous solubility or poor intestinal permeability will be associated with poor or variable drug absorption. Lipid-based drug delivery (LBDD) has emerged as a successful approach to improve drug solubilization in the dosage form and, more importantly, in the gastrointestinal (GI) tract, leading to normalized drug absorption and increased bioavailability. work in synergy with in vivo physiological lipid digestion and absorption, which facilitate drug absorption. Drug solubility depends on many physicochemical properties and is therefore a complex phenomenon. When addressing poor aqueous solubility, a drug molecule is often described as lipophilic or hydrophobic. Lipophilic molecules are insoluble in aqueous solution but exhibit a degree of solubility in lipid excipients. In contrast, hydrophobic molecules are insoluble in aqueous solution and can also be poorly soluble in lipids (i.e., hydrophobic/lipophobic). The lipophilicity of an API is described as the log P value, which can be a useful starting point in selecting lipid excipients for solubility screening. Lipide excipients should be able to solubilize APIs in the dosage form, and it is crucial that they maintain API solubility in vivo when exposed to an aqueous environment. Therefore, the behavior of the excipients in aqueous fluid is an important factor. The hydrophilic/lipophilic balance (HLB) is commonly used to categorize the degree of affinity of the lipid excipient for the aqueous phase. At Gattefossé, the HLB of excipients is determined by analytical methods and called practical HLB. Digestive enzymes play a well-known role in food transformation within the GI tract. They digest fats (triglycerides) by the hydrolysis of ester bonds, which releases free fatty acids and monoglycerides. These are naturally emulsified by bile salts into mixed micelles and transported to the GI membrane for absorption. Lipid excipients comprise fatty acid esters (e.g., glycerides and PEG esters) and are therefore subject to lipolysis by the same endogenous enzymes. The in vivo digestion of lipid excipients can further enhance drug solubility in mixed micelles, presenting the drug in a solubilized state at the GI membrane. stimulating chylomicron secretion, which results in enhanced drug uptake through the lymphatic pathway, bypassing initial metabolism in the liver. Medium chain lipids (C<12) diffuse across the enterocyte directly into blood vessels. Long unsaturated chain lipids (C18:1, C18:2) are absorbed via the lymphatic pathway. 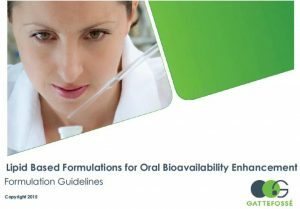 Guidelines for Lipid Based Formulations for Oral Bioavailability Enhancement, available from your local Gattefossé representatives.